I was back in Paris for a few days at the end of last year, and since there was still room in my equipment bag, I pulled my old and battered Leica CL from a drawer and took it with me. A good opportunity to check whether I could get acceptable results out of it this time. I never was a rangefinder guy. When I started being interested in photography, semi-automatic Single Lens Reflex cameras (SLRs) were already the norm, and Leica an expensive brand of obsolete cameras. My formative years were spent with a Pentax MX, and I’ve always found natural to see the world on the matte focusing screen of a reflex camera. But I was intrigued by the Leica legend, and one day, purchased a Leica CL. Over the last 15 years, I used it rarely, but being light and compact, it could find a slot in my equipment bag from time to time. The CL was a sort of entry-level rangefinder camera, designed by Leitz in Germany and built by Minolta in Japan from 1973 to 1976. From a technical point of view, it is a miniature M5, and very advanced for a Leica of its time. A semi-auto camera with through the lens metering, it used a mechanism very similar to the system used in the much maligned M5’s. After the CL and the M5 were abandoned in the mid seventies, Leitz reverted to fully manual cameras with no metering capabilities, and aficionados had to wait for another 10 years before a semi-auto rangefinder camera was proposed again by the German firm. With its M bayonet mount, the CL could use the 50 mm lenses of its bigger brothers, but Leitz had also designed two lenses specifically for the CL, a 40mm Summicron (F:2) and a 90mm Elmar (F:4). A true Leica, it also used a focal plan textile shutter (1/2 sec up to 1/1000 sec). The rangefinder has a short base and is not as accurate as the M6’s, but is good enough for the 90mm Elmar. A class at the Louvres Museum- The CL is small and silent, and nobody paid attention to me or to the camera. With its mechanical shutter, the CL only needs a battery for metering, and uses it sparingly. Mine still has the mercury battery I bought it with, but I suspect it must be at the end of its life, because the recommendations of the metering system were so bizarre that I decided to forget about it and apply the “sunny 16” rule. With a battery in working order, the determination of the exposure is very simple (a match needle at the right of the viewfinder). On the CL, the image in the viewfinder is large and clear. The viewfinder has a greater field of view than the 40mm lens normally mounted on the camera, and projected bright lines show to the photographer what the actual picture will look like. There is little difference between the respective field of views of the viewfinder (similar to a 35mm) and of the 40mm lens, but the bright frame projected of the 90mm lens will seem minuscule at the center of a viewfinder, whose enlargement factor does not change. Disconcerting, but not dramatic. What really requires adaptation is focusing. On a manual focus Single Lens Reflex camera, the image of the subject is projected on a matte ground glass, and the photographer can see immediately whether the image is in focus or not. Similarly, with tele-zooms used at large apertures, the effects of the reduced depth of field are easily visible, and the photographer can visualize what will be in focus, and what will be pleasantly blurred. On a rangefinder camera, the finder does not provide any feed-back when it comes to focusing. Every element of the image seems in focus: it’s very easy too forget to set the focus, and very difficult to predict the depth of field. The coupled rangefinder is materialized by a small window at the center of the viewfinder. It’s extremely accurate, but the focusing ring on the small lens is narrow and rather stiff, and you get the impression that you could have reacted much faster with the large focusing ring of the 50mm lens of your SLR. I guess it gets better with experience, but it’s very frustrating for a beginner. If you can get over the idiosyncrasies of the viewfinder, the Leica experience is very rewarding. The camera is virtually silent, and being small and black, gets totally unnoticed. The pictures are sharp, with a lot of micro-contrast, and give the impression of being of higher quality than the images taken with most of the SLRs (provided you could master the focusing system). Your success rate will be lower than with a manual SLR, and far lower than with a dSLR of the latest generation, but when the images are good, they’ll be very good. Rangefinder cameras are markedly different from SLRs, and will not produce good pictures without some serious practice. The first attempts will be frustrating, and there is no point in spending a lot of money in a Leica M9 if you discover after a few days that you’re totally allergic to this style of cameras. The Leica CL is one of the cheapest options for a photographer who would like to try rangefinder cameras. Good Leica CL are rather easy to find in the US or in Europe. Even in a pristine condition, they never cross the $1,000 threshold, and nice items can be found between $300 and $600. In Japan, the CL was sold as a Leitz-Minolta camera, with no other difference with the “Leitz only” CL than the logo. A few years after the production of the CL was stopped, Minolta launched the CLE, an automatic exposure version of the CL, and the first camera to propose On the Film (OTF) flash metering. There is no semi-auto or manual mode. The CLE contains much more electronics than the CL, and it can not be repaired if the main circuit decides it had enough. The CLE is much more difficult to find than the CL. Expect to pay $600 for a nice one, and thousands for collector editions. Full size M series Leica are either more primitive (no exposure metering) or more recent and significantly more expensive than the CL. Even in poor condition, a Leica M6 can not be found for less than $1,000. Cosina is still producing a line of rangefinder cameras, sold under the Voigtlander brand, and available with Leica M lens mount as well as less common mounts such as the Nikon and Contax rangefinder mounts. Amongst all the the rangefinder cameras from Voigtlander, the Bessa R3M is the closest to the CL (it accepts the same 40 and 90mm lenses), and can be found between $400 (used) and $600 (new). The light chamber of the Leica CL – In this picture, the shutter is not armed. As a consequence, the CdS sensor of the exposure meter is not deployed. The shutter is armed; the CdS sensor of the exposure meter is deployed. It will retract when the shutter release is pressed, just before the shutter opens. 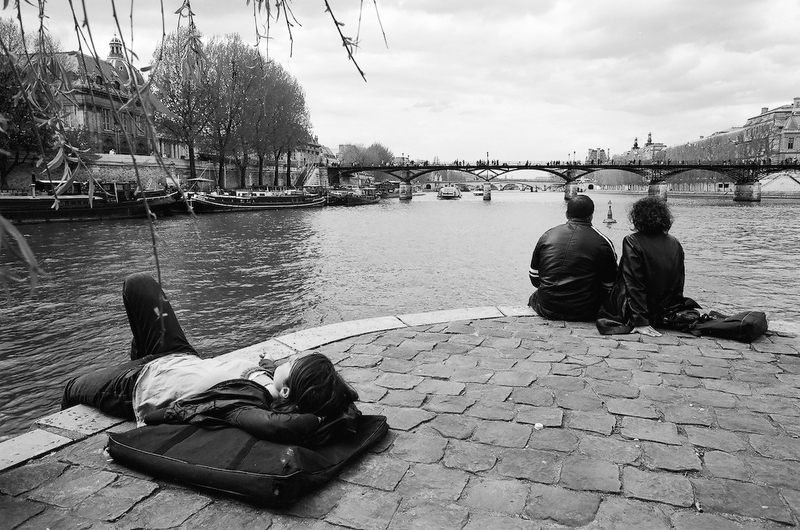 May I know who is the author of the photography called “Canal St Martin – Paris”? For the class purposes I have to find photographs made by the 35mm Rangefinder Camera (film), so I thought of using this one.